Per my plan, I am looking to have a big sale of the remaining store stock on March 30th and so this week, plan to blitz the basement to finish prepping for that. I have gone through my personal stash once, but today, I was a bit more ruthless and added some things to the ‘free to good home’ pile for the sale. 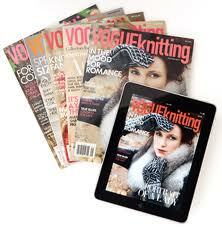 I also carted up 15 years of Vogue Knitting magazines to the man cave (the garage) for disposal. This one hurts a bit, because I know there are a wealth of old patterns and reference material in these magazines, but I haven’t looked at them in over 3 years. I am also struggling with whether to offer them on auction in Ebay versus recycling them. It looks as though they can go between $7 and $10 per magazine. But then you have to manage the listings, deal with shipping them and store them until they sell. I’ll talk to MJP, but for expediency, it’s likely best just to donate them to the Mount Seymour Thrift Shop. Tomorrow, I plan to finalize the stash items that I’m allowed to keep from the store for my personal use. With other areas cleaned out, I have a better sense of how much will fit in my new hobby room, so hope to be realistic about my stash-isfaction.